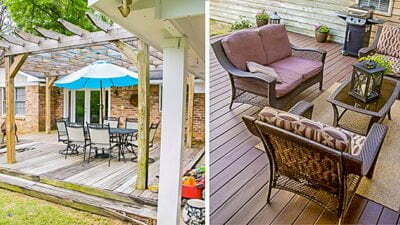 Relaxing on your deck is a great way to unwind — but you can’t enjoy it if it’s ugly, dirty or has a lot of rotted wood. Did you know there’s an alternative to the traditional wood deck? Are you a fan of wood decks or composite decks? Share your thoughts in the comments below! Composite decking is a durable, longer-lasting alternative to wood decking. Learn all about decks, including composite decking, in the latest installment of Talk to Today’s Homeowner, our Facebook Live series. From wood deck maintenance to other materials that will make your backyard a paradise, we’re covering it all! Just hit play on the video above, and follow us on Facebook for more great content!